UNITED NATIONS, January 19 -- Touting the rule of law at the UN on Thursday, Secretary General Ban Ki-moon claimed to oppose amnesties and support international prosecutions, saying that people want accountability and transparency. But after Ban spoke with Yemen strongman Ali Saleh on November 23, Inner City Press asked him if he had raised to Saleh his push for the immunity he is now in the process of obtaining. Ban replied that "I have not discussed in detail on that matter." If he opposed amnesties, that was the time to say it. Likewise in international prosecutions, since his visit to Sri Lankan internment camps in May 2009, when children at gunpoint sung to him, Ban has done little to push for prosecutions on the many reports of war crimes by Sri Lankan authorities, including some at the Sri Lankan mission to the UN. In fact, at a meeting with Sri Lankan president Mahinda Rajapaksa, Ban openly criticized his own staff rather than the alleged crimes of those he was meeting with. 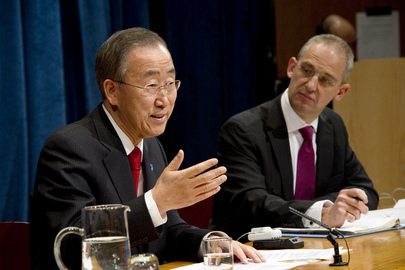 On accountability, Ban's UN does not practice it. Faced with a detailed claim that the UN's Department of Peacekeeping Operations introduced cholera to Haiti, Ban and his officials and spokesman have repeated refused to answer questions about the claim, saying the matter is with Ban's chief lawyer Patricia O'Brien, who refuses to speak with the press. Transparency? Ban is good at reading speeches that are full of holes, and then not taking questions about them. On January 18, while many media organizations "went dark" to protest prospective Internet censorship legislation in the US Congress, Ban gave a speech whitewashing his and the UN's failure to speak loudly and arrange for alternative helicopters in South Sudan after being told in mid November that the Russian helicopters would not fly. After the bloodbath occurred in Pibor and the UN was unable to bring "lethal assets to dissuade" attack, and then refused to even estimate those killed, Ban has now shifted all the blame to the Russians for saying, from mid November on, that they would not fly. As Inner City Press quoted in its January 11 story, "Maybe when asked to come and help civilians, [the Russians] should have," one Security Council member told Inner City Press. "But they weren't required to and it's [the UN's] fault that they didn't have an agreement with the Russians. Now they're trying to blame it on them." Click here for Ban's January 18 "Responsibility to Protect" speech. And so it goes at Ban's UN. "Dear Matthew, In follow-up to your question on above matter, the mission of Guinea Bissau has requested 2 days ago a minute of silence in the GA in memory of HE President Malam Bacai Sanha. Accordingly a minute of silence is planned at the plenary on January 25th." Well alright then. Ban's spokesman Martin Nesirky has by contrast refused to provide even initial answers, much less updates, on Yemen, web censorship, even who pays for Ban's travel. Watch this site.